Ice Mountain from Marc Neys (aka Swoon) on Vimeo. WIN A FREE COPY OR AN ORIGINAL PRINT: On February 1, we gave away a free copy of this book and an original linocut print to two newsletter subscribers chosen in a random drawing, so please sign up if you'd like to receive news and other exclusive special offers, 4-6 times per year, via email. Aldo Leopold once observed that "one of the penalties of an ecological education is that one lives alone in a world of wounds." 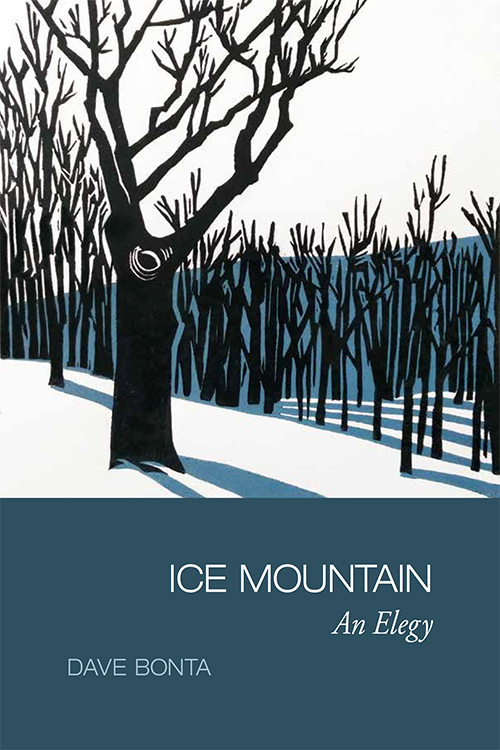 In Ice Mountain: An Elegy, poet and naturalist Dave Bonta invites us to share this solitude. In spare, linked verses informed by decades of close study of his home ground, he chronicles the slow end of winter on a mountaintop in central Pennsylvania, part of a landscape subtly but profoundly shaped by the last Ice Age. With climate change accelerating, how many more years will we get to appreciate a true Appalachian spring? But our ham-fisted efforts to address global warming also come with a price, and Bonta laments the damage done by installing a wind plant on the neighboring ridge—Ice Mountain. Looking both inward and outward, this is a poetry too honest to take refuge in easy solutions but too much in love with the world to indulge in despair. The 132-page book includes illustrations from original linocuts by Elizabeth Adams, and is beautifully printed with a heavy, matte-varnished cover. Bonta's sparse lines mimic the stark realities of a season that tests the survival of its inhabitants, “the opossum out at mid-day,” or the rhododendron leaves “stripped /by starving deer.” This rich and complex forest is in direct contrast with the paucity of life on Ice Mountain under the turbines, which he aptly calls “flowers for the dead.” Ice Mountain may be lost, but Bonta’s poems provide inspiration to protect other mountains and their inhabitants. Dave Bonta is a writer, editor, and web publisher. He's perhaps most widely known as the publisher of Moving Poems, a daily compendium of poetry videos from around the web. His own videopoems have been screened in galleries and festivals in Buenos Aires, Athens, and Leicester, U.K. In 2010, Phoenicia Publishing brought out Odes to Tools, a small book of 25 poems that originally appeared at his literary blog Via Negativa. Another Via Negativa-derived collection, Breakdown: Banjo Poems, was selected by Sascha Feinstein as co-winner of the 2011 Keystone Chapbook Prize and published by Seven Kitchens Press. Ice Mountain is his first full-length print collection. Dave lives on a mountaintop in central Pennsylvania as well as on the internet. He serves on the board of the Juniata Valley Audubon Society, based in Altoona, PA., despite the fact that he says he's "not a real birdwatcher." Radio host Jason Crane interviews Dave Bonta about his new book, his very specific way of observing and writing about nature, the difficulties of choosing "green" energy sources, and lots more, in this excellent, wide-ranging twenty-minute conversation. 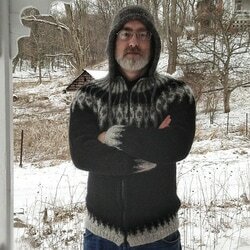 Author photo by Alison Kent, knitwear by Rachel Rawlins in an Icelandic design named after Odin, the bringer of poetry to humans.